Review by AllTheBestFights.com: 2018-03-31, fight not so exciting between Michal Syrowatka and Robbie Davies Jnr 2: it gets two stars. Michal Syrowatka entered this fight with a pro record of 19-1-0 (7 knockouts) and he is ranked as the No.25 super lightweight in the world. He lost to Rafal Jackiewicz in 2015, but since then he has won six consecutive bouts taking revenge on Jackiewicz and beating Davies Jnr in their first and last fight. His opponent, Robbie Davies Jnr, has a boxing record of 15-1-0 (11 knockouts) and he entered as the No.85 in the same weight class. Before losing to Syrowatka in July 2017, he had beat Zoltan Szabo in January. 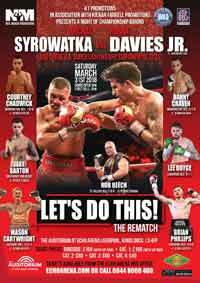 Syrowatka vs Davies Jnr 2 is valid for the WBA Continental super lightweight title. Watch the video and rate this fight!